The UFC was quick to put rumours to rest that the heavily marketed featherweight championship bout between Jose Aldo and Conor McGregor was at risk after word came out that Aldo may have suffered a broken rib while training. Aldo in turn responded releasing the below images publicly. 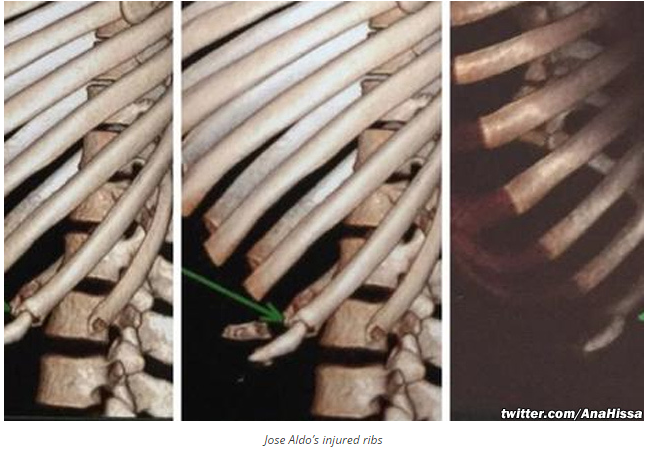 MMAJunkie contributor and orthopedic surgeon Dr. Johhny Benjamin reviewed these images and noted they indeed depict a broken rib and fighting with such a fracture can lead to “potentially life-threatening complication”. Doctors giving clearance to combat athletes to fight bear a heavy burden. MMA, according to Zuffa contracts, is an “inherently and abnormally dangerous activity”. Any physician clearing an athlete to fight must do so with utmost integrity. You need look no further than to the proposed NFL concussion settlement to understand the integral role doctors can play in the sports industry. While the lawsuit merits were never tested in court, they were fueled by allegations of doctors fraudulently undermining the real injuries and risk of injuries to athletes. These allegations breathed new life into otherwise time barred claims and exposed the NFL to enough risk they were willing to throw hundred of millions towards settlement instead of having their business practices scrutinized in trial. I should note it is not clear who the doctors are that told the UFC Aldo only had a ‘bone bruise to his rib‘ nor is it clear what ‘scans’ these doctors reviewed. Perhaps they reviewed different films. Perhaps they have a justifiable difference of opinion from Dr. Benjamin. If its the above images, however, and if Doctor Benjamin’s interpretation is correct, questions need to be asked for the sake of fighter safety. Zuffa is aware that the fight business brings risk of potential brain injury litigation. You can click here for insight from a lawyer from the firm which helped Zuffa in their lobbying efforts to legalize MMA in Canada discuss these risks and note the importance that fraud allegations played in the NFL suit. The UFC would be wise to utilize practices which would not open the door for similar allegations to be made against them.